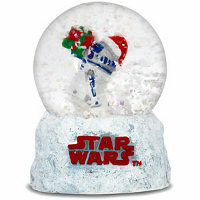 You know for sure that George Lucas must be scraping the bottom of the Star Wars franchise barrel with such an idea – the $9.99 R2-D2 Snow Globe, but I am also equally confident that there will be future winners down the road assuming he and his team rediscover their creative juices. This is basically a gift idea for the upcoming holiday season, where you get R2-D2 wearing a Santa hat with gifts in tow. You know what would be cool? Assuming you shake this Snow Globe to have it experience a white Christmas on the planet Hoth, R2-D2 ought to emit some beeps while lighting itself up – I am quite sure that can be done if some sort of kinetic energy mechanism is built-in, but considering the price you fork out for this officially licensed Star Wars collectible, I guess this will remain but a pipe dream. Perhaps in the next iteration?